The NNAT (Naglieri Nonverbal Ability Test) is a nonverbal test used for qualifying K-12 students for gifted and talented programs. The NNAT utilizes shapes and figures to evaluate problem-solving and reasoning abilities of a child without relying on their language skills. The NNAT, NNAT-2 and NNAT3 are widely used for gifted and talented admissions screening across the US. 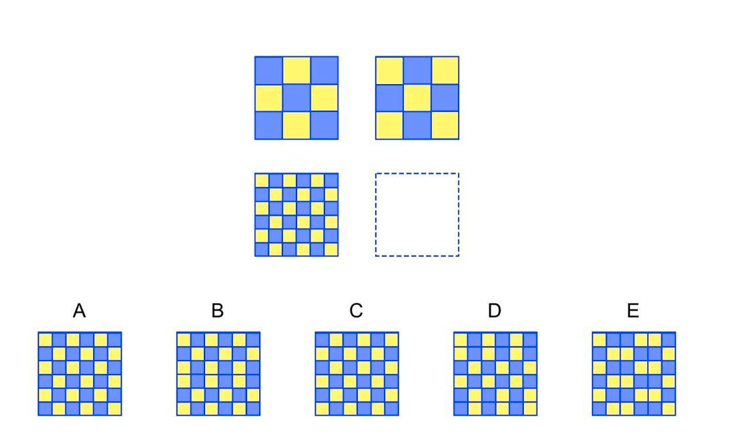 These tests assess a child’s problem-solving and visual-spatial reasoning abilities (instead of what he or she has learned in school) with questions that incorporate abstract shapes and designs. The NNAT is also considered to be the gold standard for unbiased scoring regardless of each student’s primary language, socioeconomic status, educational history or color/ vision impairment. This is because the NNAT test utilizes minimal language and written directions to avoid relying on a child’s reading, writing or language skills. Additionally, only two colors (blue and yellow) are shown. Creator: Jack A. Naglieri, PhD. The latest version, the NNAT3, takes 30 minutes to complete and includes 48 questions broken down into these four unique question types. To become familiar with these types of questions, sign up for our free 100 practice questions. Pro tip: If my child doesn’t know an answer, should they guess? The official guideline from the publisher is that students should not guess if they do not know the answer – that random guessing compromises the validity of the scores. However, the NNAT3 score is calculated based on the number of right answers and the student is not penalized for incorrect answers. As a parent looking for a high score, it is better for your child to answer all questions than leave an answer blank. Pattern completion – Students must perceive a pattern within a larger design from which a section has been removed and then identify the correct missing piece (this type often resembles a jigsaw puzzle). Reasoning by analogy – Students use visual-spatial reasoning abilities to discern logical relationships between various geometric shapes and figures (e.g., large triangle to small triangle, then large circle to small circle and so on). Serial reasoning – Students must recognize sequences created by shapes and figures that change visually to form logical patterns. For example: Once a student identifies the relationship between two images shown in the top row, the same rule applies to images shown in subsequent rows. Spatial visualization – Students must determine how two or more designs would look when they’re combined (and it some cases, rotated). They may also see questions that ask what a design should look like after it’s been folded, rotated or otherwise altered, like punching holes in a piece of folded-up paper and then identifying the new pattern that’s visible when it’s unfolded. 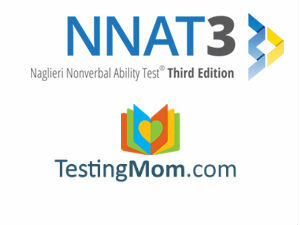 Even though the NNAT3 test is assigned by grade level, it is scored based on a child’s age. Children are compared to other children within 3 months of their own age. Whether your child is taking the NNAT-2 test or NNAT3 test, the questions are formatted in the same way. Children entering or in kindergarten will take the Level A exam, which has Pattern Completion and Reasoning by Analogy questions. Children in first grade will take the Level B exam, which has Pattern Completion, Reasoning by Analogy and Serial Reasoning questions. Children in second grade will take the Level C exam, which has Reasoning by Analogy, Pattern Completion, Serial Reasoning, and Spatial Visualization questions. Children in third and fourth grade will take the Level D exam, which has Spatial Visualization questions, Reasoning by Analogy, Serial Reasoning, and Pattern Completion questions. Children in fifth and sixth grade will take the Level E exam, which has Spatial Visualization questions, Serial Reasoning, Reasoning by Analogy, and Pattern Completion questions. Children in seventh through ninth grade will take the Level F exam, which has Spatial Visualization questions, Reasoning by Analogy, Serial Reasoning and Pattern Completion questions. Children in tenth through twelfth grade will take the Level G exam, which has Spatial Visualization questions, Serial Reasoning and Reasoning by Analogy questions. How much does this nnat test cost to order for my district? Is it easy to score? Who do I need to contact to order for my District? You would have to get in touch with the publisher of the test directly, we just offer prep materials for the skills on the NNAT, not the test itself.